K.K. 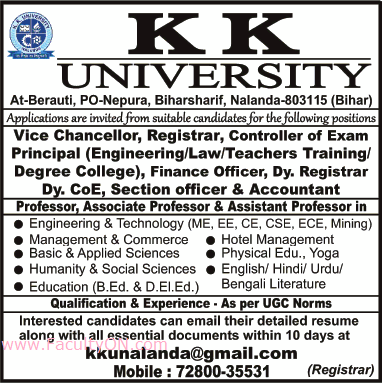 University, Nalanda has advertised in THE TIMES OF INDIA newspaper for recruitment of Teaching Faculty- Professor / Associate Professor / Assistant Professor / Principal Plus Non-Faculty jobs vacancies. Interested and eligible job aspirants are requested to apply within 10 days from 03rd October 2018. Check out further more details below. About University: The K. K. University (KKU), established under the Bihar Private Universities Act 2013 and passed by the Cabinet of Government of Bihar in its meeting held on May 16, 2917 has been notified vide 15/M 1-38/2014-1147 dt. June 8, 2017. How to Apply: Interested and eligible candidates are requested to send their resume along with copies of relevant documents and photographs to the following email address.